In a cavern deep beneath New York’s sewers, a fish-woman passes a cave painting depicting an evil-looking Ninja Turtle killing a giant turtle. 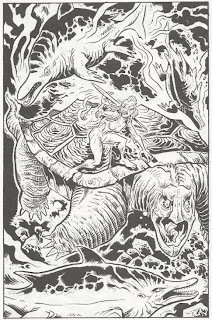 Accompanying the fish-woman is another giant turtle, though much smaller than the one depicted in the cave painting. Strapped to the fish-woman’s back is a papoose. From within comes the sound of coughing. The fish-woman inspects several barnacles lining the side of the cave near a subterranean lake. They are all empty. More coughing comes from her papoose, so she looks at the lake and accepts what she must do. Together, she and the giant turtle dive into the lake and traverse the dark underwater tunnels. Suddenly, they’re attacked by a pair of ichthyosaurs. The giant turtle fights one off, but the other manages to separate the fish-woman from her papoose. She kills the ichthyosaur with her spear and retrieves her papoose before it sinks into the inky blackness. The fish-woman and the giant turtle surface at another subterranean lake and rest on the shore. The fish-woman sees that the barnacles lining the cavern walls are “blooming”. She opens her papoose and lifts out her coughing infant. She gives the infant one of the barnacle flowers to chew on and the child instantly begins to feel better. The fish-woman smiles and ventures back into the caves with the giant turtle. *This story takes place after TMNT (Vol. 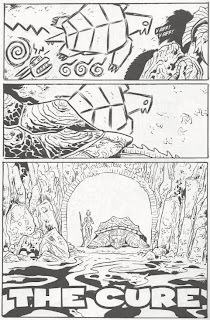 2) #5, where Leo killed the giant turtle and fought the fish-woman. *According to the opening editorial by Murphy, this story came to him in a dream, complete (save for the cave drawings). In his eyes, he feels it is about his wife and daughter. *According to Steve Murphy's opening editorial of Tales of the TMNT (Vol. 2) #17, the fish-woman who appeared in this story is named "Rhianna". She is never actually identified by that name in any of the comics. 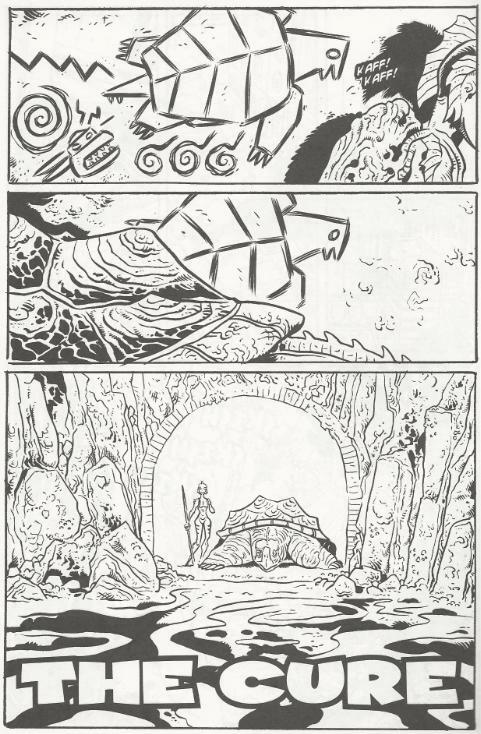 The fish-woman and giant turtle arc from TMNT Vol. 2 always left me sort of cold, as there was no build-up to it and no follow-up, either. It’s just this totally random chunk of weirdness that’s never addressed again. Well, not until this short comic, anyway. Murphy provides a pleasant epilogue to that storyline from the point of view of the fish-woman. The child who Leo nearly killed in a blind rage is shown to have survived. Not only that, but the race of giant turtles seem to have endured, with this smaller one looking to be the offspring of the bigger one Leo killed (he was having a bad day). It’s a sweet tale of a mother going through Hell to help her child and the devotion of a true friend to see her along the way. That being said, it still undermines “Sons of the Silent Age”, one of Murphy’s best stories, by showing that the fish-people survived extinction. Now, I’m not a cruel guy; it’s not like I WANT the fish-people to all die off. I’m just saying that when the entire thematic point of “Sons of the Silent Age” is the tragedy of extinction, showing that the creatures didn’t actually go extinct kinda pulls the rug out from under it, right? Really, they should have just left well enough alone and not revisited “Sons of the Silent Age”. To be fair, it was Lawson who chose to revive the fish-people back in TMNT Vol. 2, so I don’t blame Murphy for exploring that continuation some more. And while it seems contradictory, I AM happy that this epilogue gives the fish-people something bordering on a happy (or hopeful) ending. If the fish-people HAD to be brought back from oblivion, you might as well do something different with them rather than try to recapture the drama of “Sons of the Silent Age” by dooming their race a second time. “The Cure” is a long overdue follow-up to a Volume 2 storyline. In terms of the Volume 2 narrative, I’m glad we got it.